After almost a full year of no significant change, December saw a shake up of BlackBerry 10 users, as OS 10.3.3 began its slow rollout. The Stuff I Need app saw 29.6% of downloads come from users running OS 10.3.3, while for the game Pixelated this was at 15.8% of users. This data was collected by BlackBerry World for downloads of the free strategy game Pixelated and the free checklist app Stuff I Need. Data shown on the chart is from the beginning of December 2015 through the end of December 2016. The Weather Beautiful App has been updated to version 2.4 for Android, iOS, and BlackBerry 10. This version is quicker to refresh the weather and location when the app is relaunched. Additionally there was a bit of optimization done to the app to make the underlying code quicker and simpler. The Projectile Physics app has been updated for iOS, Android, BlackBerry, and Windows Phone. After this update the app now uses the official ISO value for acceleration due to gravity. Additionally iOS and Android users are now given the option to remove all advertising from the calculator with an in-app purchase. Version 5.8 of Xploding Boxes has been released, bringing the total number of levels in the game up to 540. This newest version of the game is available in Google Play, the Amazon App Store, BlackBerry AppWorld, Windows 10/Windows Phone App Store. Starting with this release, the minimum supported OS version for Android has been increased to 4.0 (Ice Cream Sandwich). 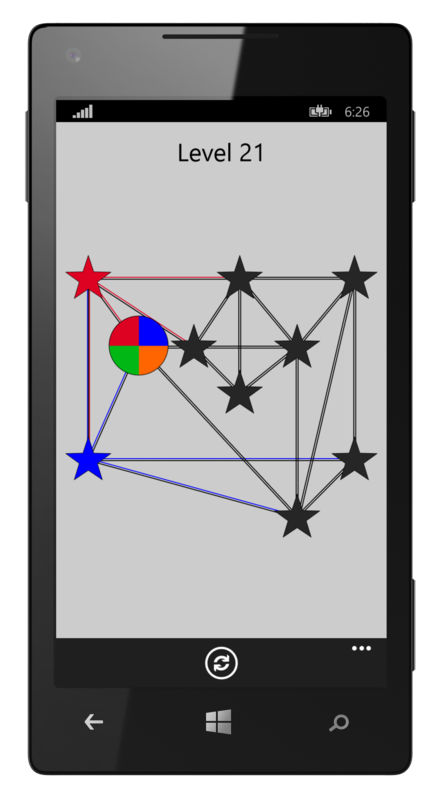 Xploding Boxes is a strategy game where the goal is to start a chain reaction that will explode all of the boxes on the screen. Each level presents a different look and number of touches, requiring a different strategy to solve. The game itself, and the first 25 levels are available for free, while a one time in-app purchase can be used to access the rest of the levels for just $2.99 while still maintaining your progress from the free levels. 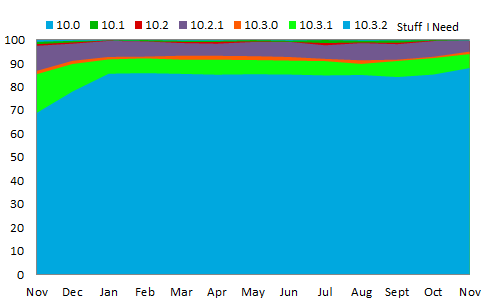 There has been little to no change in the distribution of OS versions used on BlackBerry 10 phones for the past year. 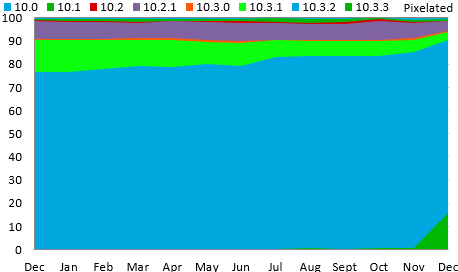 Of course a large part of this is that BlackBerry abandoned their OS a bit over a year ago, but with every device eligible to run the newest version of the OS there are still roughly 10% of users on some variation of OS 10.2. This data was collected by BlackBerry World for downloads of the free strategy game Pixelated and the free checklist app Stuff I Need. Data shown on the chart is from the beginning of October 2015 through the end of October 2016. 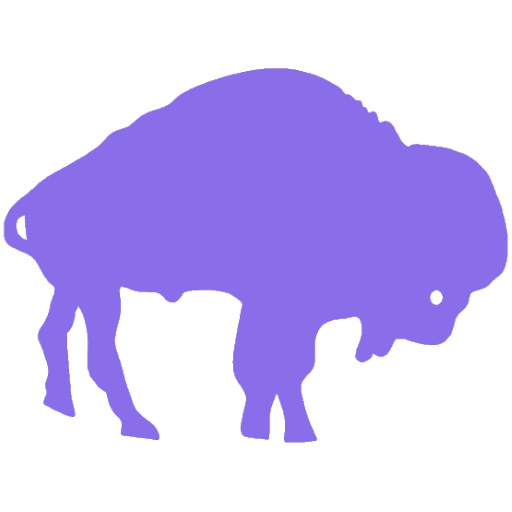 The Buffalo Metro Rail app has been updated to version 1.3. This update makes use of the new data format that is being used by the NFTA, and also adds support for iphones and iPads. The Weather Beautiful app has been updated for Android and BlackBerry phones. Now at version 2.3, the Weather Beautiful is more efficient, and also includes a two percent reduction to the file size of the app. This is a simple weather app that displays stunning photography of your surrounding area. In addition to the current temperature and weather conditions, the app also allows you to scroll for a full weekly forecast. The upgrade cycle for newer BlackBerry 10 OS versions has stalled out. 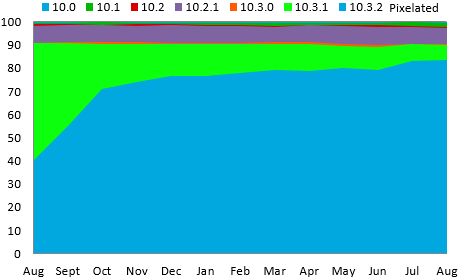 The use of 10.3.X has remained steady at approximately 90% of usage. This data was collected by BlackBerry World for downloads of the free strategy game Pixelated and the free checklist app Stuff I Need. Data shown on the chart is from the beginning of August 2015 through the end of August 2016. 10,000 Farkle has been updated to version 2.6 in BlackBerry AppWorld. This update smooths out some of the animations and improves the responsiveness of the game. Additionally the app now uses a custom accent color throughout all of the menus.